Julia didn't grow up in a gardening family but slowly learned by trial and error (mostly error) about vegetable gardening in sunny, warm Sacramento, California. 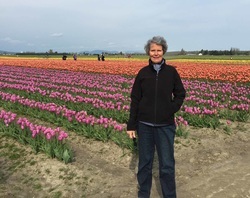 After moving to Orcas Island in 2002 she realized there was a lot more learning to do in this new climate and signed up for the Master Gardening class of 2004. She is still cheerfully making errors and learning about northwest gardening and plants. Julia is a geologist and is always happy to answer questions about geology and soils. I have lived on Orcas Island since late 2008, previously in Palo Alto, CA. We ended up here in retirement, largely due to an article I saw in Gourmet magazine about food in the San Juan Islands. I took the MG training in 2011. I have to say that I am not much of a WA state gardener because I do not have a deer fence. I plant stuff, but the deer and rabbits eat it. I used to have a nice perennial garden in CA, if that counts. I also grew some pretty good tomatoes and lettuces in pots on my deck last summer. And year before last, I had 28 peaches on my Frost peach tree. This past year I had none (deer again). But I am mostly interested in plant id and landscape design. I like to walk around and identify things in the landscape. I've been a Master Gardener for 12 years on San Juan Island and I've had an organic vegetable garden for 25 years in the backyard of my Seattle home. I've worked with the University of Washington for 27 years and am the past president of the Master Gardener Foundation of San Juan Islands. Diana left the RIGHT coast, beautiful dogwood and azalea springs, and REAL hoagies, for the LEFT after college (Chestnut Hill, Philadelphia). She immediately fell in love with with the west coast and knew that was where her heart was. Turned out her future husband was there too, in her classes at Monterey Institute of Foreign Studies. After they finished their degrees in Latin American Studies, they moved to Seattle, for work, to start a family and, for Diana, to start a love affair with all things northwest. 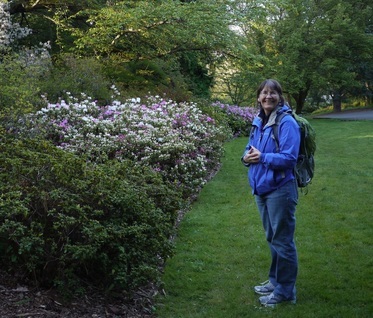 After teaching high school Spanish in Seattle for 12 years, Diana retired to San Juan Island with her husband and a bucket list, with Numero Uno being: become a Master Gardener. Check! Her MG passion is composting, vermi-composting in particular. If you need some worms to start a worm bin, ASK her! She loves to read, walk, write, sketch, and dig in the dirt. 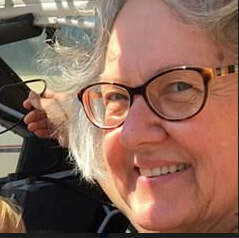 Sandy moved to San Juan Island in 2012 with her husband and two children from Bellevue, WA. She grew up in Upstate New York and was inspired about the many ways to garden and propagate plants. She enjoyed fresh peaches, apples, cherries and walnuts from her grandparents and local trees and looked to provide that experience on her San Juan Island property. On San Juan Island she manages a market vegetable garden as well as many fruit trees. With the abundance provided by the garden, she is able to bring extra produce to the farmers market, local restaurants and the food bank. Sandy took the Master Gardening Training in 2015. The Master Gardeners Program has been instrumental in providing valuable resources and networking to be a successful gardener. I came to Orcas as a part-time resident in the summer of 2009 with my husband Jens Kruse. By the summer of 2014, we had pulled up stakes entirely in Wellesley, Massachusetts, -- where we had lived for over 30 years working and raising our two sons – and become fulltime residents of Orcas Island. I’m a Soviet Area Studies specialist by graduate training (that dates me!) and a labor relations specialist (National Labor Relations Board) by profession (that probably also dates me!). I had never really gardened before arriving on Orcas. But the majestic beauty of the San Juans, the unique climate, and people all around me growing things drew me to want to grow things too. Another inspiration was meeting so many wonderful and interesting people here on Orcas who were Master Gardeners encouraging me to take the MG training – which I did in 2015. My favorite MG activities thus far have been plant diagnostic clinics (learning new things and problem-solving projects! ), vermicomposting (my coddled worms live in the climate-controlled environment of our house! ), and growing heirloom tomatoes up on the sunny deck (away from the deer on our shady, unfenced property). MG training teaches you the concepts and introduces you to the tools, but the most important thing you learn is how much there is to learn! 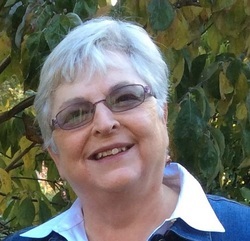 Dianne grew up in California and remembers planting gardens as a child with her Dad. After college she moved with her husband and two children around the United States experimenting with gardens in the rich loam of the midwest, the hot humid south and the desert conditions of eastern Washington. In 2012 when she visited the San Juans on a bike trip, she knew this was where she wanted to retire to garden. 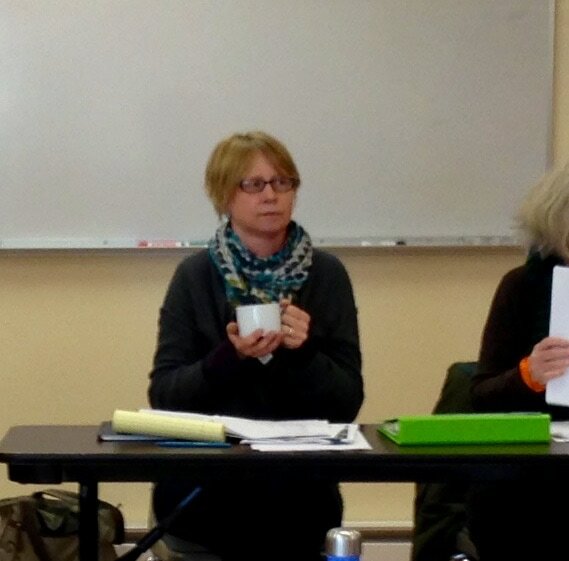 Master Gardener training was completed in 2015 and there remains plenty to learn and challenges to meet in this unique NW coastal environment. When I retired in 2003 and we moved to Lopez, gardening was on my agenda. I knew next to zero about plants, deer, bunnies, nasty soil, and weeds. I poked stuff in the ground willy nilly and hoped it would grow. They were all the same size when I planted them but I soon learned they all had minds of their own. I had a lovely little flax plant, a friend came over, took one look and said "oh boy". Three years later it was the size of my house. My career in interior design had not helped at all. Sofas and chairs don't grow. Garden club was next then Master Gardeners in 2013. I enjoy learning about gardening from like-minded souls. My husband Bill and I have been married for 50 years, have one daughter, one son-in-law and 2 grandchildren. Pat became interested in gardening while a teacher. Her first experience of growing sunflowers with students was a disaster. The Florida rain poured off the roof onto the seeds and washed the seeds away. 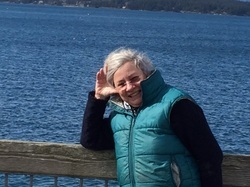 Pat and her husband purchased land on Lopez Island in 1979 and moved to Lopez in 2010. On many vacation trips west Pat was impressed with the school garden at Lopez School. Using the Lopez School garden as a model she began gardening with her students in Miami. With the help of grants and volunteers a class garden was begun. Then the class garden grew into schoolwide gardens with many teachers participating. After learning the plight of monarch butterflies and noticing that Miami had a resident population of Monarch butterflies she began learning about native plants to help maintain this local population. From living in Miami, Florida all those years she realized she knew nothing about native plants or gardening in the NW. 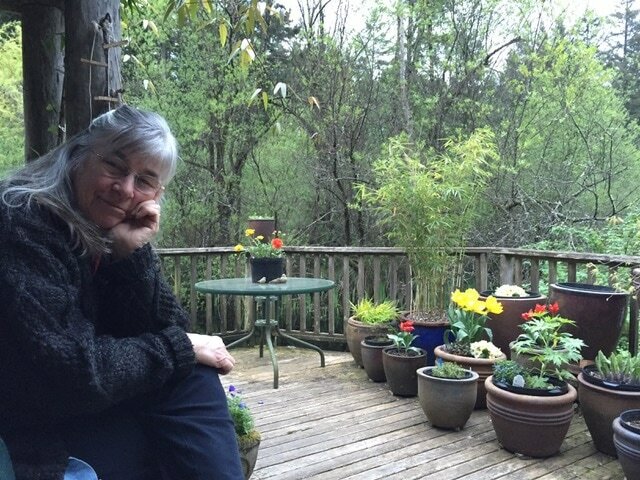 She became a MG in 2015 to become more knowledgeable about gardening in the San Juan Islands.